This is the first part in a series on pragmatic techniques for debugging ontologies. See also part 2. All software developers are familiar with the concept of debugging, a process for finding faults in a program. The term ‘bug’ has been used in engineering since the 19th century, and was used by Grace Hopper to describe a literal bug gumming up the works of the Mark II computer. Since then, debugging and debugging tools have become ubiquitous in computing, and the modern software developer is fortunate enough to have a large array of tools and techniques at their disposal. These include unit tests, assertions and interactive debuggers. Ontology development has many parallels with software development, so it’s reasonable to assume that debugging techniques from software can be carried over to ontologies. I’ve previously written about use of continuous integration in ontology development, and it is now standard to use Travis to check pull requests on ontologies. Of course, there are important differences between software and ontology development. Unlike typical computer programs, ontologies are not executed, so the concept of an interactive debugger stepping through an execution sequence doesn’t quite translate to ontologies. However, there are still a wealth of tooling options for ontology developers, many of which are under-used. There is a great deal of excellent academic material on the topic of ontology debugging; see for example the 2013 and 2014 proceedings of the excellently named Workshop on Debugging Ontologies and Ontology Mappings (WoDOOM), or the seminal Debugging OWL Ontologies. However, many ontology developers may not be aware of some of the more basic ‘blue collar’ techniques in use for ontology debugging. In my own experience one of the most effective means of finding problems in ontologies is through the use of OWL reasoning. Reasoning is frequently used for automated classification, and this is supported in tools such as ROBOT through the reason command. 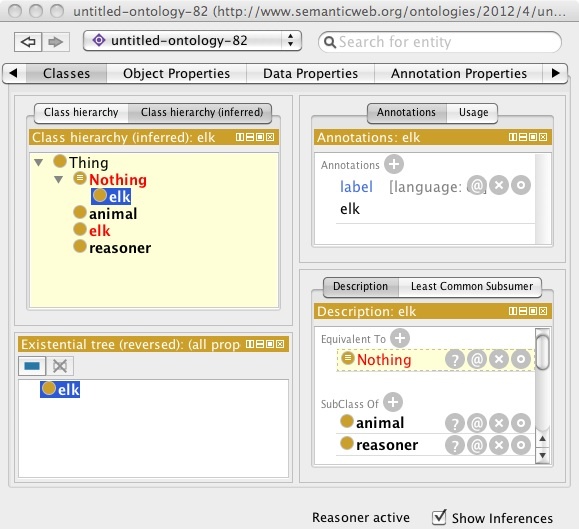 In addition to classification, reasoning can also be used to debug an ontology, usually by inferring if the ontology is incoherent. The term ‘incoherent’ isn’t a value judgment here; it’s a technical term for an ontology that is either inconsistent or contains unsatisfiable classes, as described in this article by Robert Stevens, Uli Sattler and Phillip Lord. A reasoner will not find bugs without some help from you, the ontology developer. You have to impart some of your own knowledge of the domain into the ontology in order for incoherency to be detected. This is usually done by adding axioms that constrain the space of what is possible. The ontogenesis article has a nice example using red blood cells and the ‘only’ construct. I will give another example using the DisjointClasses axiom type; in my experience, working on large inter-related ontologies disjointness axioms are one of the most effective ways of finding bugs (and has the added advantage of being within the profile of OWL understood by Elk). Let’s take the following example, a slice of an anatomical ontology dealing with cranial nerves. The underlying challenge here is the fact that the second cranial nerve (the optic nerve) is not in fact a nerve as it is part of the central nervous system (CNS), whereas true nerves as part of the peripheral nervous system (PNS). This seeming inconsistency has plagued different anatomy ontologies. You may have noted this example uses slightly artificial classes of the form “Structure of X”. These are not strictly necessary, we’ll return to this when we discuss Generic Class Inclusion (GCI) axioms in a future part. This shows all the axioms that lead to the conclusion that CranialNerveII is unsatisfiable. At least one of these axioms must be wrong (for example, the assumption that all cranial nerves are nerves may be terminologically justified, but could be wrong here; or perhaps it is the assumption that CN II is actually a cranial nerve; or we may simply want to relax the constraint and allow spatial overlap between peripheral and central nervous system parts). The ontology developer can then set about fixing the ontology until it is coherent. Protege provides a nice way of finding ontology incoherencies, and of debugging them by examining explanations. However, it is still possible to accidentally release an incoherent ontology, since the ontology editor is not compelled to check for unsatisfiabilities in Protege prior to saving. It may even be possible for an incoherency to be inadvertently introduced through changes to an upstream dependency, for example, by rebuilding an import module. Luckily, if you are using ROBOT to manage your release process, then it should be all but impossible for you to accidentally release an incoherent ontology. This is because the robot reason command will throw an error if the ontology is incoherent. If you are using robot as part of a Makefile-based workflow (as configured by the ontology starter kit) then this will block progression to the next step, as ROBOT returns with a non-zero exit code when performing a reasoner operation on an incoherent ontology. Similarly, if you are using Travis-CI to vet pull requests or check the current ontology state, then the travis build will automatically fail if an incoherency is encountered. ROBOT reason flow diagram. Exiting with system code 0 indicates success, non-zero failure. ERROR org.obolibrary.robot.ReasonerHelper - There are 1 unsatisfiable classes in the ontology. Large ontologies can strain the limits of the laptop computers usually used to develop ontologies. It can be useful to make something analogous to a ‘core dump’ in software debugging — a standalone minimal component that can be used to reproduce the bug. This is a module extract (using a normal technique like SLME) seeded by all unsatisfiable classes (there may be multiple). This provides sufficient axioms to generate all explanations, plus additional context. I use the term ‘unsatisfiable module’ for this artefact. This can be done using the robot reason command with the “–debug-unsatisfiable” option. If the ontology is incoherent then “make debug.owl” will make a small-ish standalone file that can be easily shared and quickly loaded in Protege for debugging. The ontology will be self-contained with no imports – however, if the axioms come from different ontologies in an import chain, then each axiom will be annotated with the source ontology, making it easier for you to track down the problematic import. This can be very useful for large ontologies with multiple dependencies, where there may be different versions of the same ontology in different import chains. The next article will deal with the case of detecting unwanted equivalence axioms in ontologies, and future articles in the series will deal with practical tips on how best to use disjointness axioms and other constraints in your ontologies. Thanks to Nico Matentzoglu for comments on a draft of this post. The set of relationships is specified in column 16 of the GAF file. However, many tools are not capable of using class expressions – they discard the additional information leaving only the pre-composed GO_Class. Using OWLTools it is possible to translate a GAF-v2 set of associations and an ontology O to an equivalent GAF-v1 set of associations plus an analysis ontology O-ext. The analysis ontology O-ext contains the set of anonymous class expressions folded into named classes, together with equivalence axioms, and pre-reasoned into a hierarchy using Elk. Annotations: label "apoptosis and occurs_in some dopaminergic neuron"
This class will automatically be placed in the hierarchy using the reasoner (e.g. under ‘neuron apoptosis’). For the reasoning step to achieve optimal results, the go-plus-dev.owl version should be used (see new GO documentation). A variant of this step is to perform folding to find a more specific subclass that the one used for direct annotation. The reverse operation – unfolding – is also possible. For optimal results, this relies on Equivalent Classes axioms declared in the ontology, so make sure to use the go-plus-dev.owl. Here an annotation to a pre-composed complex term (eg neuron apoptosis) is replaced by an annotation to a simpler GO term (eg apoptosis) with column 16 filled in (e.g. occurs_in(neuron). The folding operation allows legacy tools to take some advantage of GO annotation extensions by generating an ‘analysis ontology’ (care must be taken in how this is presented to the user, if at all). Ideally more tools will use OWL as the underlying ontology model and be able to handle c16 annotations directly, ultimately requiring less pre-coordination in the GO. Elk is a blindingly fast EL++ reasoner. Unfortunately, it doesn’t yet support the full EL++ profile – in particular it lacks disjointness axioms. This is unfortunate, as these kinds of axioms are incredibly useful for integrity checking. See the methods section of the Uberon paper for some details on how partwise disjointness axioms were created. The problem is that whilst Elk supports intersection and equivalence, it doesn’t support Nothing. This means that there may be corner cases in which it doesn’t work. Proper disjointness support may be coming in the next version Elk, but it’s been a few months so I decided to go ahead and implement the above translation in OWLTools (also available in Oort). Remeber, ordering of arguments is significant in owltools -make sure you translate *after* the ontology is loaded. The “-u” option will check for unsatisfiable classes and exit with a nonzero code if any are found, allowing this to be used within a CI system like Jenkins (see this previous post). Remember, there are corner cases where this translation will not work. Nevertheless, this can be useful as part of an “early warning” system, backed up by slower guaranteed checks running in the background with HermiT or some other reasoner. Perhaps the ontologies I work with have a simpler structure, but so far I have found this strategy to be successful, identifying subtle part-disjointness problems, and not giving any false positives. There don’t appear to be any scalability problems, with Elk being its usual zippy self even when uberon is loaded with ncbitaxon/taxslim and taxon constraints translated into Nothing-axioms (~3000 disjointness axioms).